Set in Marrakesh, a 1-minute walk from Saadian Tombs, For You Hostel Marrakesh offers free bikes and garden. The property is located a 2-minute walk from Moulay El Yazid Mosque. The hostel features a shared lounge. Kasbah is a great choice for travelers interested in markets, old town exploring and food. The new For You Hostel property is located close to the famous Place Jamaa El Fna and local Souks 6mn walk. The property itself is situated in Kasbah, primarily a local area that is new to tourism. Kasbah is a small oasis of peace and local Moroccan tradition, located within walking distance from all the tourist amenities and Souks of Marrakesh. We offer all the typical services of a backpackers or B&B, but with a unique local focus at discount prices. Guest rooms at the hostel come with a seating area. 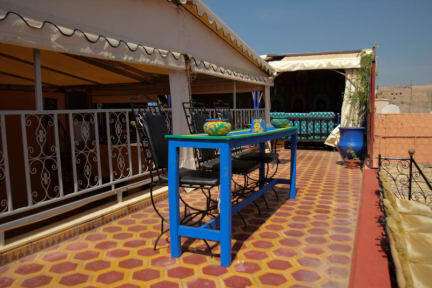 Featuring a private bathroom with a bath, rooms at For You Hostel Marrakesh also boast free WiFi, while selected rooms here will provide you with a garden view. At the accommodation, all rooms are equipped with a shared bathroom with a bidet. En-suit bathrooms, 24 hour reception, luggage storage, free WiFi and a variety of excursions. New roof terrace!